1 Extra Options At the Start/Options screen, press LEFT, UP, RIGHT, RIGHT, UP, LEFT, RIGHT, RIGHT, LEFT, LEFT, UP. An Extra menu will appear with cheats. up option (munch, munch, slurp, gulp - belch - phtui!). 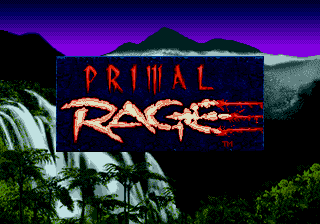 Too bad the SNES version isn't as ballsy. 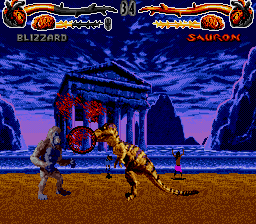 MORTAL kombat of the dinosaurs! How can it get better??? IDK either! you can fight, bite, and ummm idk... but theres this cool cheat that allows a player to eat or pee on the huimans cheering you on in the background its a funny great game! This game sucked. Sucked so hard. It is completely devoid of fun gameplay! 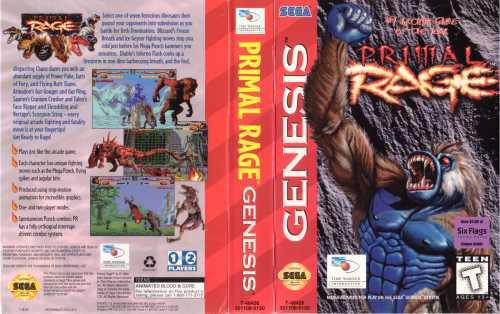 Primal Rage Is the Most Biggest Monster Fighting Game In the Whole World. 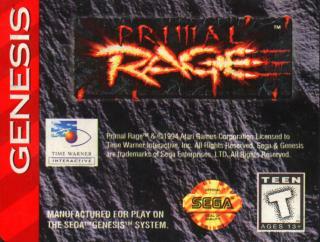 It Should Be Re-Released, For Play Station 2, X-Box, Nintendo Gamecube, & Game boy advance. It has 7 Lands in the World That Your Character Can Conquer. & If you Beat all 7 Monsters & Conquer Lands You have to replenish Your health Before the Final Stage. If you Beat all 7 Monsters again in the final stage you win the game. It has Characters Including Sauron, Talon, Vertigo, Chaos, Blizzard, Diablo, & Armadon. There Mean Ferocious, Fierce, Wild, & Dangerous as King Kong and Godzila.